There’s no easy way to find out which is the better software development model for your business, open-source or proprietary. Open-source has its plate full of developers and programmers who are least intimidated by the idea of commercializing software, but it poses threat to the commercial software industry who are most threatened by the notion of open-source software. The difference between the two is fairly clear because each model has its fair share of pros and cons. However, weighing down the options between open-source and proprietary to find which one’s superior is a difficult task. As with any decision making complexities, you can only be certain about “it depends”. Clearly, one has a little edge over the other in terms of features and characteristics which definitely set them apart. The idea that one totally contradicts the other is not exactly true. This article explains the difference between the two. It all started with Richard Stallman who developed the GNU project in 1983 which fueled the free software movement which eventually led to the revolutionary open-source software movement. The movement catapulted the notion of open-source collaboration under which developers and programmers voluntarily agreed to share their source code openly without any restrictions. The community of people working with the software would allow anyone to study and modify the open-source code for any purpose they want. The open-source movement broke all the barriers between the developers/programmers and the software vendors encouraging everyone to open collaboration. Finally, the label “open-source software” was made official at a strategy session in Palo Alto, California in 1998 to encourage the worldwide acceptance of this new term which itself is reminiscent of the academic freedom. The idea is to release the software under the open licenses category so that anyone could see, modify, and distribute the source code as deemed necessary. It’s a certification mark owned by the Open Source Initiative (OSI). The term open source software refers to the software that is developed and tested through open collaboration meaning anyone with the required academic knowledge can access the source code, modify it, and distribute his own version of the updated code. Any software under the open source license is intended to be shared openly among users and redistributed by others as long as the distribution terms are compliant with the OSI’s open source definition. Programmers with access to a program’s source code are allowed to manipulate parts of code by adding or modifying features that would not have worked otherwise. Unlike open source, there are some software the source code of which can only be modified by the individual or organization who created it. The owner or publisher of the software holds intellectual property rights of the source code exclusively. We call this type of software “proprietary software” because only the original owner(s) of the software are legally allowed to inspect and modify the source code. In simple terms, proprietary software is software that is solely owned by the individual or the organization that developed it. Proprietary software, as the name suggests, are exclusive property of their creators or publishers and anyone outside the community are not allowed to use, modify, copy or distribute modified versions of the software. The owner of is the exclusive copyright holder of the software and only he has the rights to modify or add features to the program’s source code. He is the sole owner of the program who can sell it under some concrete conditions which should be followed by the users in order to avoid any legal disputes. Unlike open source software, the internal structure of proprietary software is not exposed and the restrictions are imposed upon the users by the End User License Agreement (EULA), the conditions of which are to be legally followed by the end users regarding the software. Examples of proprietary software include iTunes, Windows, macOS, Google Earth, Unix, Adobe Flash Player, Microsoft Word, etc. The idea alone that developers and programmers are allowed to examine and modify the source code as deemed necessary shouts aloud control. More control means more flexibility, which means non-programmers can also benefit from the open collaboration. Proprietary software, on the contrary, restricts control only to the owner of the software. Because anyone with the required knowledge can add or modify additional features to the program’s source code to make it work better, it allows better sustainability of the software as indiscrepancies in the software can be rectified and corrected repeatedly. As developers can work without any restrictions, it allows them to rectify errors that might have missed by the original developers or publishers. Open-source software packages often have missing drivers which is natural when you have an open community of users with access to every single line of code. The software may include code modified by one or more individuals, each subject to different terms and conditions. The lack of formal support or sometimes use of generic drivers can put the project at risk. Proprietary software means closed group support which means better performance. Unlike open-source projects, proprietary ones are typically designed keeping in mind a limited group of end users with limited skills. They target a small knit circle of end users unlike projects accomplished within open source communities. Users outside the programming community won’t even look at the source code let alone modify it. The viewing restrictions barred the end users from modifying the code let alone debugging it effectively with no control over possible workarounds. The internal structure of proprietary software is strictly closed-access meaning they lack transparency which makes it virtually impossible for users to even suggest modifications or optimizations to the software. Open source, on the other hand, promotes open collaboration which means lesser bugs and faster bug fixes with fewer complexities. Open-source refers to the software whose source code is available for anybody to access and modify, while proprietary software refers to the software which is solely owned by the individual or publisher who developed it. Unlike open-source software, proprietary software is managed by the individual or the organization that holds exclusively the intellectual property rights of the source code and nobody outside the circle is allowed to view the code let alone inspect it. The main difference between the two is that open source projects have the ability to evolve as they can be iterated upon by millions of developers located across the globe. Sagar Khillar. 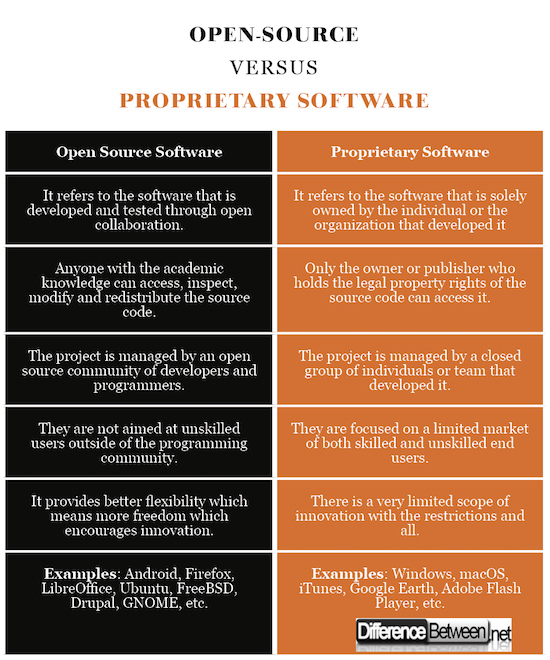 "Difference Between Open Source and Proprietary Software." DifferenceBetween.net. 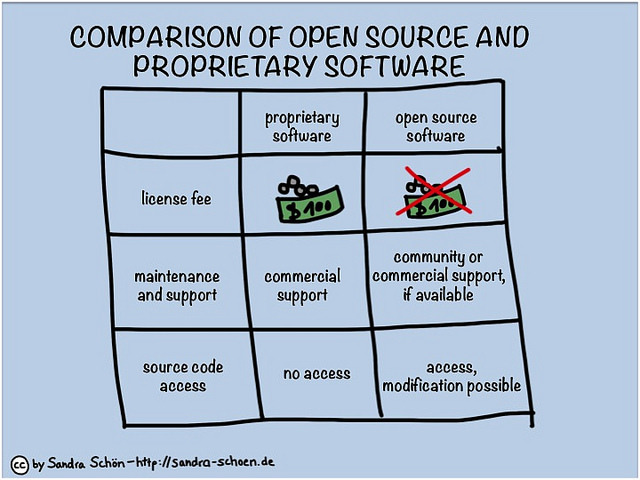 April 5, 2018 < http://www.differencebetween.net/technology/difference-between-open-source-and-proprietary-software/ >.